Just a quick Muir conditions update in case anyone is thinking of heading up there this week. After skiing Mt St Helens on Monday and finding large areas of corn in the afternoon sunshine, I figured that Muir would be a good destination to look for more corn on Tuesday, given that the freezing level was forecast to rise even further to about 11000 ft. And checking the telemetry in the early morning showed overnight temps of 35-38 �F at Muir, plenty warm enough (I thought) to soften things up. But it was not to be. *** Down low, Paradise to 6500 ft: Worse. Everything is crusty snow, breakable crust in spots. It's way too flat to corn up this time of year. *** Mid elevations, 6500-7500 ft: Mostly similar to Dec 1. Pan Face was very firm even at 11am, and just barely skinnable with ski crampons. Very sketchy skinning, with no previous skintrack visible on the firmest part, and the rest of the skintrack up the Face had been destroyed by inconsiderate or clueless people on foot. The snow coverage along the winter ridge route is nonexistent from 7300-7400 ft, and even in Pebble Creek, the route through the rocks is becoming very bare. In the afternoon though, the steep south and SW slopes in this elevation range held the only corn of the entire route, on the steep rolls above Pebble Creek and also the SW ridge of Panorama Point. *** Lower part of Snowfield, 7500-8500 ft: Worse. It's still firm windpacked powder, but getting much rougher due to footsteps and wind scouring, no longer smooth like on Dec 1. Large areas of rain crust are becoming exposed here too, although most are easily avoided. *** Up high, above 8500 ft: Much worse than Dec 1, similar to Nov 28. The wind-deposited snow which had covered up the rain crust between Nov 28 and Dec 1 has now been wind scoured, exposing large areas of bare icy crust. About 50% icy crust above 8500 ft, and over 90% icy crust above 9500 ft. Ski crampons were essential for skinning up, and skiing down was tolerable only if you are used to skiing ice. 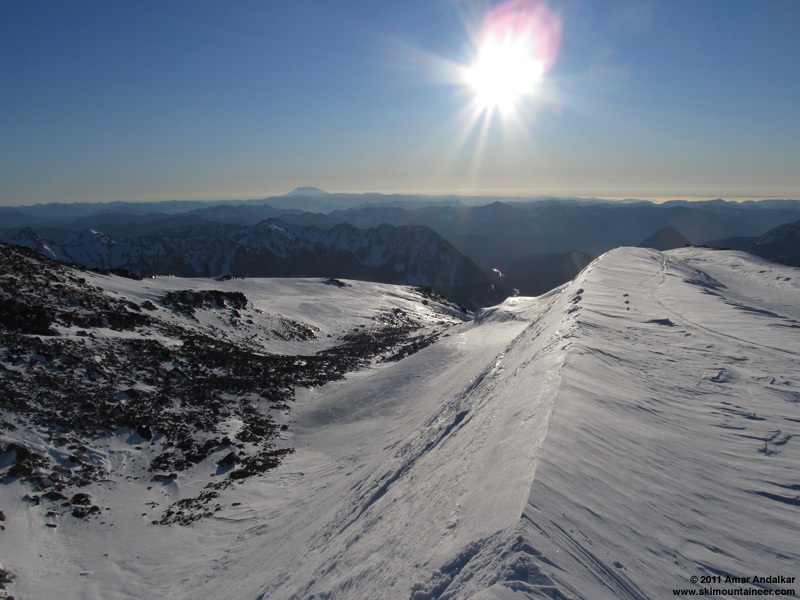 Three-shot panorama looking south from Camp Muir, with Mounts Adams, Hood, and Saint Helens in the distance to the south. It was quite an experience to drive through dense fog along SR 167 near sea level with the temperature at 28 �F, knowing that 10000 ft vertically overhead, the temperature was 10 degrees warmer (under standard conditions, it should be 35 degrees colder at 10K than at sea level) -- an exceptionally large temperature inversion. Temps rose throughout the last part of the drive up to Paradise. Left the nearly empty parking lot around 10:20am (only 3 other cars) and reached Muir at 2pm, catching up in the last stretch to the only other skier on the route this day. Such a beautiful warm and sunny day, almost calm except for occasional strong gusts above 8000 ft, which oddly enough came from the north sometimes and the SW other times. Can't recall ever seeing the wind shift back and forth like that on Rainier, on a few-minute time scale, over and over from nearly-opposite directions. Spent a half-hour relaxing in the sun on the mostly-wind-protected south side of the hut, chatting with the other skier. The occasional SW gusts would still hit us directly with a spray of ice crystals, so eventually it was time to test the ice. Looking back up from about 9500 ft near Anvil Rock, the skiing was much worse than it looks -- note the absence of visible ski tracks. Very bad skiing above 9500 ft, then tolerable below that by following long fingers of wind-deposited snow atop the crust. I kept thinking it would suddenly go over to corn at some elevation, but it never did, all the way down to the steep rolls above Pebble Creek. 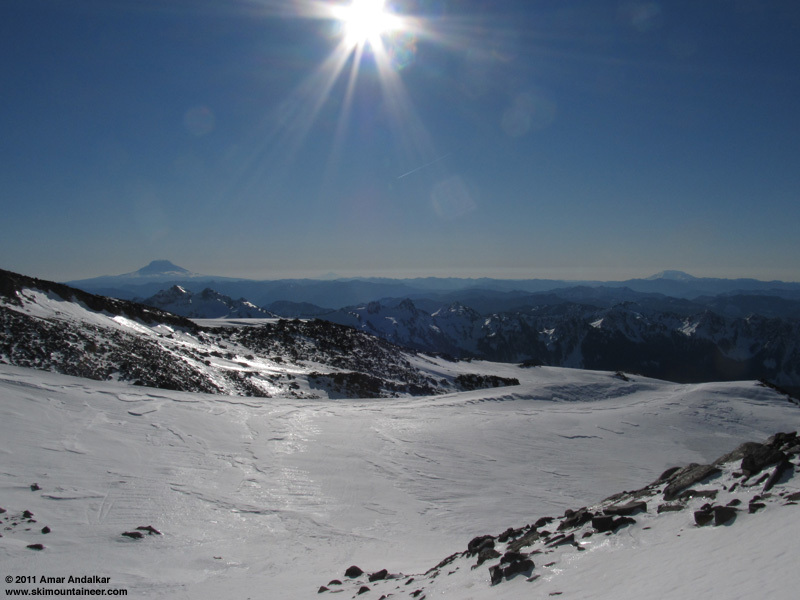 Even with an 11000 ft freezing level, the Muir Snowfield may just not be steep enough to corn up in December when the solar elevation barely exceeds 20� above the horizon at noon. There were short pitches of corn on the rolls, since the 45�+ faces get the low sun more directly -- enough for a couple nice turns on each roll. Perched on the edge of a short slope of corn at Pebble Creek. After gingerly walking on skis through the rocks at Pebble Creek, there was more icy crust, and all the way down the rolls atop Pan Point too. The entrance to Pan Face is getting very bare with exposed plants and rocks, so I decided to ski down the SW ridge of Pan Point instead. These steep SW and south facing slopes had corned up nicely, and I enjoyed about 400 vert of good turns before reaching the crusty flats below. My ski tracks down the ridge to the right of Pan Face. Unfortunately, no cool flying jellyfish clouds or brilliant sunsets today, just a very clear and cloudless day. It was still a worthwhile trip for me, but only for the exercise and the usual amazing views, not so much for the skiing. And it was so nice to get up high, above the foggy murk that never lifted from the Puget Sound lowlands. SYNOPSIS...AN UPPER RIDGE CENTERED OFFSHORE COMBINED WITH LIGHT PRESSURE GRADIENTS OVER WESTERN WASHINGTON WILL GIVE COOL AND DRY CONDITIONS. A WEAKENING FRONT WILL BRING A CHANCE OF LIGHT RAIN OR SNOW TO THE AREA WEDNESDAY. THE UPPER RIDGE AND ASSOCIATED HIGH PRESSURE AT THE SURFACE WILL GIVE MORE DRY BUT STAGNANT CONDITIONS TO THE AREA WEDNESDAY NIGHT THROUGH FRIDAY NIGHT. A WEAK FRONTAL SYSTEM MAY BRING SOME RAIN OR SNOW THIS WEEKEND. TUESDAY...SUNNY. FREEZING LEVEL 11000 FEET. TUESDAY NIGHT...MOSTLY CLOUDY. FREEZING LEVEL 10500 FEET. WEDNESDAY...MOSTLY CLOUDY WITH A CHANCE OF SNOW AND RAIN. SNOW LEVEL 5000 FEET. WEDNESDAY NIGHT...MOSTLY CLOUDY. FREEZING LEVEL 5000 FEET. FRIDAY...SUNNY. FREEZING LEVEL 10000 FEET. FRIDAY NIGHT...MOSTLY CLOUDY. FREEZING LEVEL 8500 FEET. SATURDAY AND SATURDAY NIGHT...MOSTLY CLOUDY. A CHANCE OF SHOWERS. SNOW LEVEL 3000 FEET. SUNDAY...MOSTLY CLOUDY WITH A CHANCE OF SNOW SHOWERS. SUNDAY NIGHT AND MONDAY...MOSTLY CLOUDY. FREEZING LEVEL 3000 FEET. Thanks for the report Amar. Guess I'll be going to Crystal. With the upper air subsidence that we have been experiencing for the past week or so, the sinking air is heated dramatically, but it is also very dry. Even though the air temperature may be well above freezing, not much snow melts.� It just evaporates into the low humidity air. The evaporation keeps the snow surface temperature below freezing. To get true corn snow, there must be several freeze-thaw cycles. 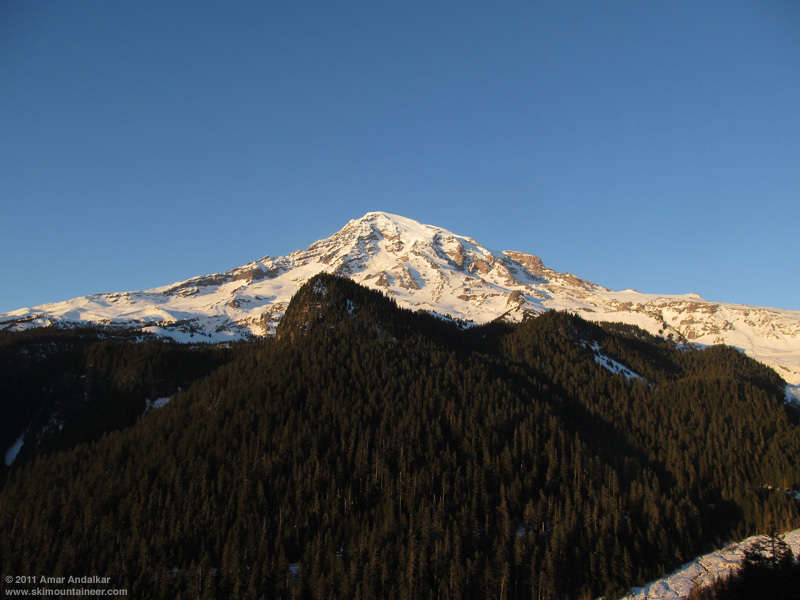 With the current conditions there is no thaw.� Thus, corn snow is unlikely. Interesting point about the low humidity and evaporation, Bryan. I had not thought about that. But despite those factors, corn has been forming on steeper southerly aspects. 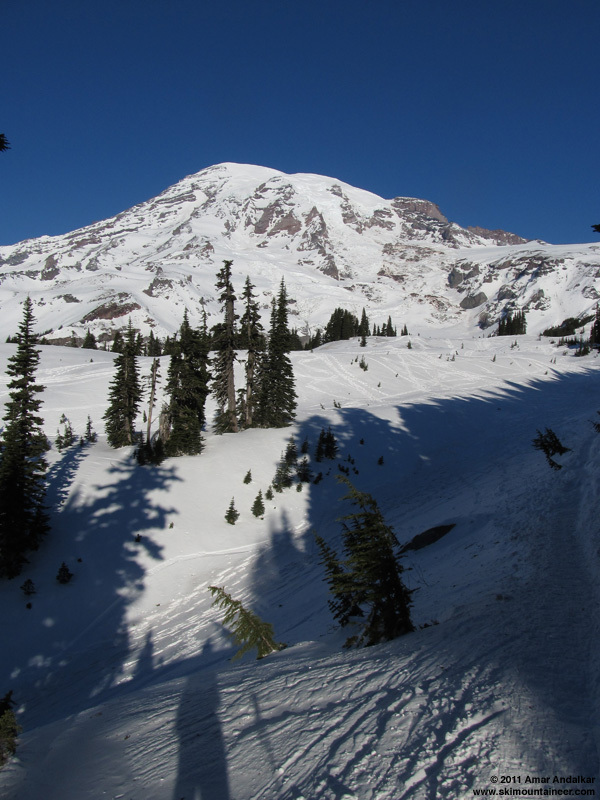 Like the steep rolls at Pebble Creek, and below Pan Point, and on many portions of the south side of Saint Helens, even as high as 8000 ft. Also on steep south aspects in the Crystal backcountry, as found on Dec 4. 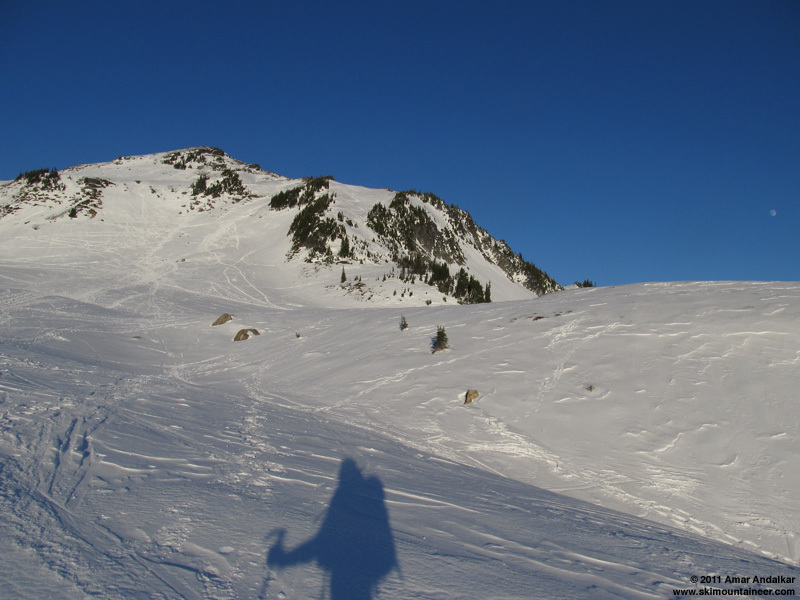 All of that appeared to be real melt-freeze rounded grains of corn snow, at least to my eyes and to my skis. But I did not inspect the snow crystals closely. 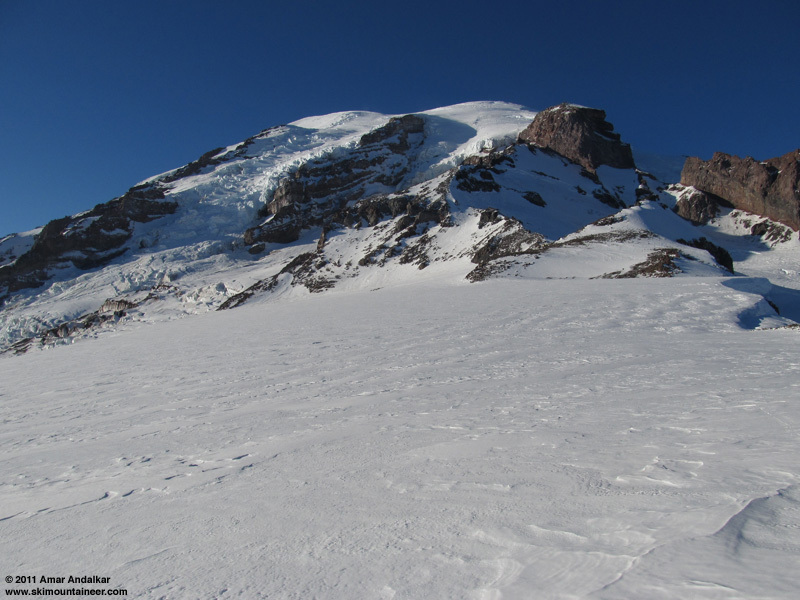 So it seems like lack of steepness is the limiting factor which is preventing the Muir Snowfield from corning up right now. On steeper southerly slopes, the solar intensity has clearly been sufficient to overcome evaporative cooling and allow a melt-freeze cycle to occur most days during the past week.